Into the Millenium...I discovered the repertoire of Edith Piaf in 1982 . I remember that year well. I had literally stitched together a tiny revue on her life and songs and presented it in a tiny Cabaret in San Francisco, a place with a coffee can sound, on top of the Hill. Since that day, I had known what I was truly doe-eyed with on the subject of Piaf, and it was not who she had had love affairs with or the tragedies of her life, which God only knows she had plenty of, but rather her repertoire mesmerized me. It was obvious to me that her life was in her songs, and I wondered how in the world did she command this array of very talented composers and lyricist to write only for her? I made it my quest to search and travel to Paris and meet some of the composers that had bestowed upon her their life long treasures for only her to sing. One of them, Henri Contet, most impressed me and we became pen pals since 1992. I visited him last in Paris on January 27 1998, three months before he passed away at the age of 92 . Our friendship was so sweet to me, I was reviving the songs he wrote over 5o years ago and he saw in me that flame so Piafesque that never dies. Needless to say I was honored, flattered and grateful for his friendship.  When it came to Piaf and her songs, I only had to close my eyes and imagine a play with music*", or a concept for a full length Ballet (although "Le chemin des Forains" was not part of the song list in "Hearts", I later found out, Piaf sang it in Maurice Bejart's first Ballet), or a radio documentary and a TV documentary* . The opportunities were endless. In selecting those songs which would appear on this album, I once again had to close my eyes, speak to my heart and go over the more than 400 songs she had recorded and pick and choose what would thrill an American audience as well (In his latest CD, Jazz legend Toots Thielemens, who had played Guitar for Piaf, pays tribute to Piaf in two songs sung by Diana Krall and Shirley Horn "Chez Toots"). The music and the words had to be outstanding. Django Reinhardt accompanies Piaf in her version of "Cri du Coeur" which summarizes the Piaf Phenomenon, the cry of the heart, with its joys or sorrows. From my heart to yours, I give you the music of Edith Piaf.